The Owl D2 Wide Gel System can run from 10 to 80 samples on one gel. The wide gel size allows you to load 15 or 30 samples per row with a multichannel pipette format combs. This economical unit has multi functions and it is great to screen PCR samples or use for routine DNA fragment analysis. The small footprint allows it to fit on even the most cluttered lab bench. Ships complete with Buffer Chamber, SuperSafe Lid with Attached Power Supply Leads, EasyCast Gasketed U.V. 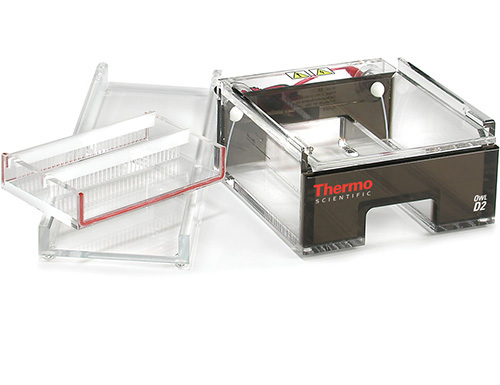 Transmissible (UVT) Gel Tray, External Multiple Gel Caster, 4 Combs: (2) 30 Well and (2) 40 Well, 1.5 mm Thick. By using these combs and a multichannel pipette, samples may be loaded directly from a 96-well plate, 8 or 12 at a time. This speeds up transfer and reduces the chance of sample order error. Part Number D2-CST. Please note that trays are not included.